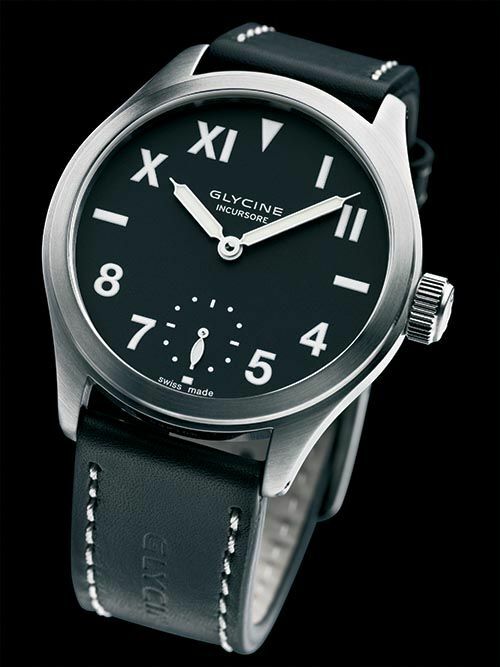 Glycine introduced their new lineup of Incursore watches, reminding us how it all started with this model in 1998. The Glycine Incursore was a very large watch for that period in time, and I remember that because a watch collector acquaintance of mine had a Glycine – which I thought was just ridiculously sized at the time. The new Incursore II model is 44mm in diameter (no biggie in 2010) and comes in a hand wound mechanical version as well as an automatic movement version. The first Incursore in 1998 was a hand wound model, so I would personally go for that one. The nicely brushed 44mm case holds either the hand wound ETA/Unitas 6498 movement or the automatic ETA 2824-2 movement. The automatic version has a centered seconds hand as opposed to the hand wound version, which has a small seconds hand at 6 o’clock. Besides the differences in esthetics of these two models in dial print and location of the seconds hand, be aware of the fact that the caliber 6498 movement was made for large (pocket) sized watches and the caliber 2824-2 is a relatively small movement. Both models have a see through case back, so you will notice this difference soon enough. 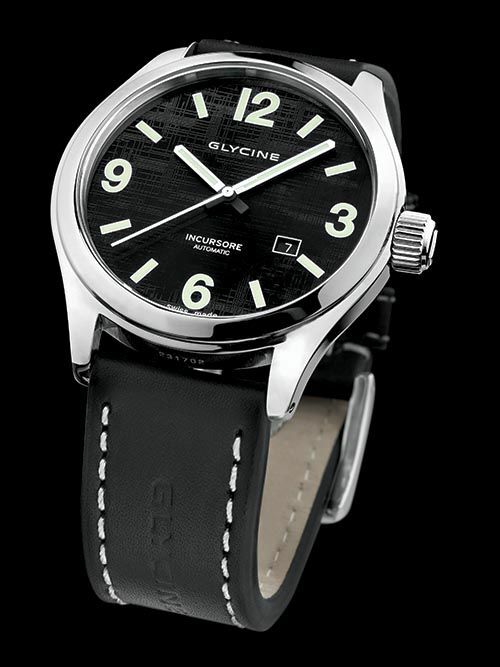 What I really like about Glycine, is that the prices of these watches are very fair. It seems to become very common that watch brands just charge over 3000 euro for a plain 3rd party movement driven time piece, with no history, credits, decent after sales support or whatsoever. Glycine is a brand that exists for almost 100 years now, has a few famous or even iconic watch models (think Airman, as covered here before) and uses a price point that should be in reach for every watch collector. The Glycine Incursore II is available for 890 CHF (approximately $900) with a leather strap and add 100 CHF more for a stainless steel bracelet. The price for the automatic and hand wound movement is equal.